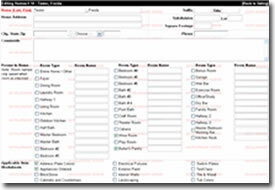 Here are a few of our custom programming projects. 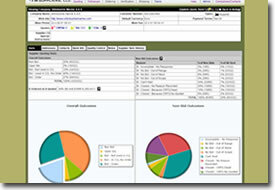 PM runs their entire procurement business on a custom-built intranet developed by Advantage. They are in the business of emergency delivery of super alloys to the oil & gas offshore industry and their intranet must simply function 24/7. The intranet tracks all incoming product requests, dispatches inquiries to manufacturers worldwide and provides sales staff with a quick overview of best pricing and availability. The intranet is available to PM’s worldwide employees remotely at any time for maximum efficiency and minimal response time to customer inquiries. In addition, PM is an ISO 9000 Quality System certified company, and the intranet is built to satisfy all ISO requirements around product procurement. Olivera Construction builds many luxury homes simultaneously and needed a tool to bring together their home owners, the designers and their sub-contractors to avoid costly errors due to miscommunications about paint color selections, tiles, roofs and more. We created a web-based application running on open source PHP/MySQL where homes are set up and configured with number of rooms, types of rooms, types of amenities and all applicable design selections. The designer now sits with the home owner and via secure VPN access, goes through the various selections, saves and locks them to the home database in real-time, giving immediate selection details to the home builders and their sub-contractors. 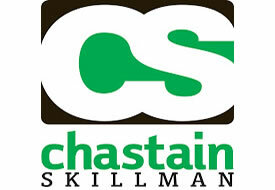 For Chastain Skillman, it’s a big job – keeping track of the hundreds of locations, buildings and rooms that need to be identified, assessed and mitigated for asbestos risk and abatement. We created a web-based database that enables CS engineers to file and find drawings, photographs, documents, work in progress, and keep track of the status of each. CS’ clients are granted secure internet access to the extranet; keeping them updated at all times. 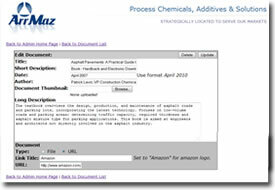 The engineers at ArrMaz, a custom chemicals manufacturer, have authored many valuable whitepapers and studies. Rather than just put them out on their website as regular downloads, we programmed a password-protected library. “Card holders” must register for access and provide full contact information. ArrMaz can monitor card holders’ checkouts to identify their areas of interest and follow-up with appropriate sales calls. Another benefit is that because the whitepapers are intellectual property, the password-protected library gives them some control over distribution.